West Springfield's auditorium seats 1,150 - that's a lot of potential customers at each performance, browsing the show program and reading your ad! 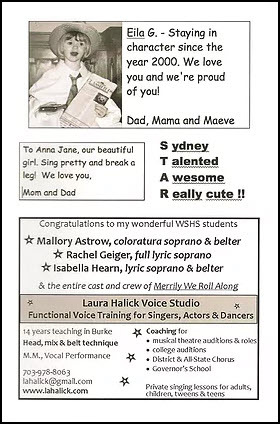 Family and friends can also take out personal ads to congratulate cast and crew! Follow this link to order an ad for the Les Mis program! All inside ads are printed in grayscale. The back cover may be full color. Allow for 1/8-inch margins in your ad design. Camera-ready art (a .jpg/.jpeg or .pdf file) is preferred. Sample program page with a quarter page ad, two eighth page ads, and one half page ad. Discounts given for businesses that purchase ads for the fall play and the spring musical!